Corona Daze Charters provides fishing charters in Wrightsville Beach NC, fishing charters in Topsail Beach NC, and fishing charters in Wilmington NC. Call Captain Mike Hoffman today to book your next fishing charter and you will be able to catch some of the fish species listed below. They have a streamlined body and are dark blue on top that fades into silvery sides and belly. The average size of these fish is 25 to 45 pounds. Amberjack are large, streamlined fish with deeply forked tails. They have a amber stripe that runs all the way down the side and through the eye. They are olive to dark amber on the back which fades to silvery sides and a white belly. The average size of these fish is 30 to 60 pounds. The Barracuda is a long, slender fish with a pointy snout and a large mouth full of sharp teeth. They are silver with green or grayish green backs and have several black or dark spots on their sides near the tail. The average size of these fish is 7 to 20 pounds. They are bronze, copper or grayish black which fades to a white belly and they have barbels/whiskers under the chin.They are sometimes more silvery in appearance with just hints of copper or bronze coloring. The average size of these fish is 20-70 pounds. 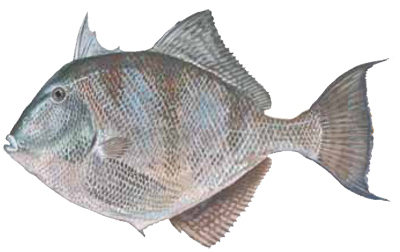 According to Wikipedia, the world record Black Drum is 113 pounds. 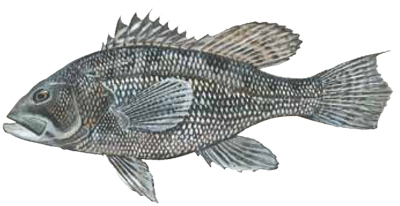 Also know as Sea Bass, they are black or very dark brown on the back and sides. Their fins also tend to be dark colored. The average size of these fish is 1/2 to 3 pounds. They have an elongated body that is dark blue on the top and silvery on the bottom. They may have some golden hues and several pale vertical bars are sometimes present down the sides. The upper jaw is long and extends into a spear. The average size of these fish is 200 to 500 pounds. They have a streamlined body and are dark blue on top that fades into a silvery color on the sides and white on the belly. They often have small light-colored spots on the belly. The average size of these fish is 30 to 150 pounds. Bluefish have a long bluish green body and a light colored belly. They have a sharply forked tail and razor sharp teeth. The average size of these fish is 1 to 15 pounds. Bonita have a streamlined body and are dark blue on top that fades into a silvery sides and belly. They have several stripes that run along the back. The average size of these fish is 4 to 8 pounds. Cobia are large, long fish that are dark brown on the back and sides that fades to a white belly. The tail has a deep fork. The average size of these fish is 10 to 50 pounds. Also known as Croaker or Hardhead these fish are silvery all over with a white belly. They sometimes have a faint bronze or golden cast with yellowy fins and brassy colored wavy lines down the sides. They also have barbels/whiskers under the chin. The average size of these fish is 1/2 to 2 pounds. A very colorful fish that tends to have a bluish green or turquoise top that fades into greenish sides with a yellowish belly. 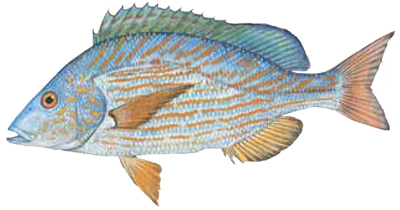 The fish is covered with small bluish green dots and the body is elongated with a blunt head. It has a deeply forked tail. The average size of these fish is 2 to 15 pounds. 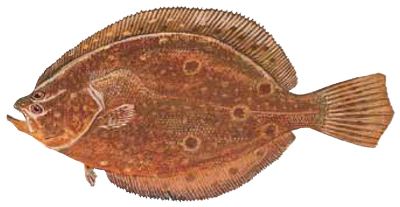 Flounder have a rounded flat body that is brown on one side and white on the other side. Both of their eyes are on the brown side of the fish. They have 5 spots on the brown side. The average size of these fish is 1/2 to 5 pounds. Triggerfish have a deep body and are grayish overall in color. Some of them have some darker mottled lines. They have pronounced lips, large teeth, and tough skin. The average size of these fish is 1 to 5 pounds. 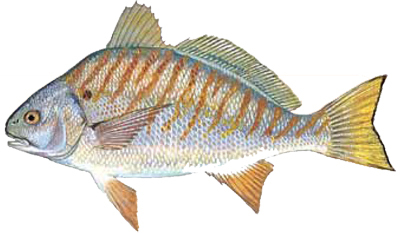 Pigfish are grayish on the back that fades to silver on the sides with a silvery white belly. They have bronzy lines scattered over much of their body. The fins are usually a dull gold color. The average size of these fish is 1/2 to 1 pound. They have a blunt head and a streamlined body with a deeply forked tail. They are greenish gold on the back that fades into yellowy sides and a yellow belly. There is a black spot on the gill cover and the pectoral fin. The average size of these fish is 3 to 20 pounds. King Mackerel are long, slender fish with a mouthful of sharp teeth. They are bluish green or blusih grey on top that fades into silvery sides and belly. The fins are a darkish color. The average size of these fish is 7 to 25 pounds. 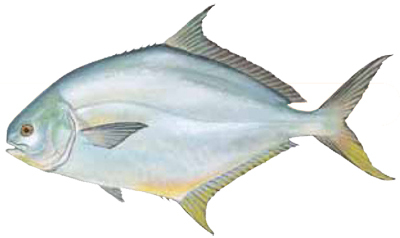 Pompano have a rounded, flat body and a small mouth. They have a deeply forked tail and they are greenish gray with yellowy coloration along the back that fades into silver sides and a yellowy belly. The average size of these fish is 1/2 to 2 pounds. Also known as Channel Bass, Redfish, or Puppy Drum. Red Drum have a copper to bronze colored back which fades to a white belly and a large black spot on the end near the tail. They are sometimes more silvery in appearance with just hints of copper or bronze coloring. The average size of these fish is 10 – 50 pounds. According to Wikipedia, when they are over 27 inches long, they are called “bull reds.” The record for the largest Red Drum ever caught is 94 pounds and was caught on Hatteras Island in 1984. They have an elongated body that is blue on top and silver on the bottom. They have a very large blue dorsal fin that looks like a small sail and a long upper jaw that entends into a spear. They are related to the White Marlin and the Blue Marlin. The average size of these fish is 30 to 60 pounds. 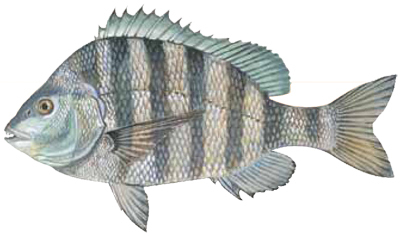 Sheepshead are grayish in color along the back and sides with a lighter gray belly. They have 5 or 6 black or dark brown thick strips that run down their sides. The average size of these fish is 2 to 8 pounds. Spanish Mackerel are slender fish with deeply forked tails and a mouthful of sharp teeth. They are greenish blue on top that fades to silver sides and belly. They have a lot of bronzy spots of their sides. The average size of these fish is 1 to 3 pounds. Also known as Speckled Trout or Spotted Trout. They have a silvery grayish back and a white belly with round black dots on their back and sides. The average size of these fish is 1 1/2 to 4 pounds. 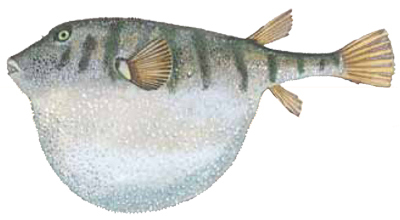 Spots are silvery all over with a white belly and a prominent black spot which is located behind the gill cover and above the base of the pectoral fin. They also have several brassy colored wavy lines down the back. The average size of these fish is under 1 pound. Also known as Rockfish or Striper. Striped Bass are silvery with a white belly. The back is a dark or dusky brownish color. They have 7 or 8 black stripes that run horizontally down the back and sides. The average size of these fish is 4 to 15 pounds. The Tarpon is a long fish with a single dorsal fin with a long trailing filament. They have a large mouth with a protuding lower jar, large scales, and a deeply forked tail. They are silver with a greenish gray or bluish gray back. The average size of these fish is 35 to 90 pounds. Long, slender fish with a pointy snout and and a mouthful of sharp teeth. They are dark blue on tap with pale blue sides and a silvery blue belly. Dark verticle bands run along the sides. The average size of these fish is 20 to 35 pounds. They have an elongated body that is dark top on top and silvery on the bottom. The upper jaw extends into a spear. Closely related to the Blue Marlin. The average size of these fish is 40 to 70 pounds. They have a streamlined body with yellow fins. They are dark blue on top with golden highlights on the side and a light colored belly. The average size of these fish is 30 to 80 pounds.